8:00 AM to 4:30 PM Monday through Thursday. All faxed and e-mailed Purchase Orders for RSIC clips and specialty products will begin to ship in 2016. Please E-Mail orders to orders@pac-intl.com and fax orders to 866-649-2710 for processing. We appreciate feedback of all kinds. Comments, questions and suggestions may be sent to PAC International, Inc. Customer Care at info@pac-intl.com. If you need detailed product information, performance testing, UL Fire Resistive Design Assemblies, etc. to specify RSIC® products in your project, please contact us at support@pac-intl.com. Are you a member of the news media looking for information on PAC International, Inc.? Email your questions to Elzo Gernhart, at elzo@pac-intl.com. Are you interested in discussing media events, a partnership opportunity, or sponsorships with us? Email your proposal to sponsorships@pac-intl.com, and be sure to include your contact information and details about the opportunity. Interested in investment information about PAC International, Inc.? Email your questions to PAC International, Inc. Investor Relations at ir@pac-intl.com. Interested in working for PAC International, Inc.? Please contact us at careers@pac-intl.com. PAC International, Inc., is a world leader in Noise Control Solutions and is an environmentally friendly and socially responsible company. We have made conscientious decisions to support our country by manufacturing in the United States, and by assembling our RSIC products utilizing disadvantaged citizens through Opportunity Village in our local community. 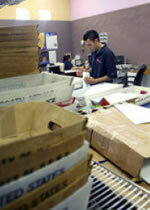 Zaulo Gonzalez works in the mailroom of Opportunity Village on Sept. 29. The nonprofit’s mailing contracts have taken a hit in the current economic climate because its regular clients aren’t doing as many mailings. Most every one of the 350 clients at Opportunity Village would say the lengthy morning bus ride to work each morning is worth the trip. Some hop on a bus at 5 a.m. to start their six-hour shift at Opportunity Village by 8 a.m. Some don't make it back home until 5 p.m. Still, "Thank God it's Friday" isn't a phrase thrown around much at the organization, a nonprofit in Spring Valley that provides paid work and training for mentally disabled adults. "They hate the weekend," Opportunity Village sales coordinator Rachel Allen said. "They have friends here, and at home, they're bored." The organization has plenty of eager and able workers, but what they are desperate for is work. Opportunity Village contracts with businesses to do work -- often monotonous tasks -- that most every office does. The organization's crews shred paper, stuff envelopes and assemble and test parts. Opportunity Village's packaging and assembly contract work has dropped by 60 percent in the past year, its mailing orders by 75 percent, and its hotel room utility packets by 25 percent. Alma Harris works on remotes at the Employment Training Center at Opportunity Village. Some of the organization's contract work has diminished as companies bring the tasks in-house to keep their workers employed, Opportunity Village sales and marketing manager Laura D'Amore said. "Their intentions to save their employees are good, but to save their business, it's less expensive to come to us," she said. "We can do these jobs for less." Opportunity Village doesn't have the overhead that most companies do. It's utilities and most other bills are covered by donations, so it is able to charge less. Opportunity Village charges businesses for each assembled or packaged unit. The pay for each employee varies depending on his or her capability and productivity. Elzo Gernhart, co-owner of Pac International Inc., said his expenses to have the company's soundproof rubber clips assembled were cut in half when he contracted the work to Opportunity Village employees three years ago. Tiffany Green works in the Employment Training Center. She says she likes to work the sealer machine because she can make more money. "We saw this as an opportunity to give back to the community, while, at the same time, it was better for our business," he said. "It's a win-win." Even still, Gernhart's orders have plummeted under the weakening economy. "The market has caused us to drop off substantially," he said. "It's because of Opportunity Village that business hasn't slowed down as much as others in our market. It could be much worse." Opportunity Village's main campus at 6300 W. Oakey Blvd. bustles with activity from 8 a.m. to 5 p.m. weekdays. On a recent workday, groups of men and women worked outside to keep the property tidy, scrubbing windows and sweeping sidewalks. Inside the employment training center, more than 150 men and women worked at tables. In one room, people wore hats and gloves while they placed plastic utensils, salt, pepper and creamer into bags to be sealed and placed in hotel rooms -- a job from The Mirage. In another room, workers sat in front of TV screens to test and clean remote controls -- a job from Cox Communications. Sheila Duckworth, one of the employees in the Employment Training Center at Opportunity Village, 6300 W. Oakey Blvd., puts together cutlery sets for a local casino. A supervisor oversees each table of employees. He or she checks the quality of work before the product is sent out with a stamp of approval on it. Alma Harris, 28, quickly clicked batteries into remote controls to test its buttons. She said her favorite job is stuffing envelopes. "That's the most fun," she said. The third room is meant to be for mail orders. The organization employs a graphic designer, and its clients run a print room where they can create and send out fliers and advertisements. Because contract work from real estate and insurance companies has disappeared, Opportunity Village clients stuff bags with utensils. With the recent slump in contract jobs, the men and women work months ahead on orders that have not yet been placed. At this point, they have enough utensil packages to last The Mirage six months. Allen said Opportunity Village wants to keep clients employed, so they continue to invite them to work every weekday. "They're still working and we still pay them," she said. "But we're coming up under budget." Clients have noticed less work. The projects they work ahead on, like stuffing bags, pay less than some of the larger contracts. "I used to get a bigger pay check," said Tiffany Green, who did her part in the assembly line two weeks ago sealing bags -- her favorite job. "It pays more," said 32-year-old Green, who's worked for the organization for a year. Mike Sokoloff, production coordinator, said contract work with Opportunity Village not only trims a business' bottom line, but it also gives adults with disabilities a chance to learn about the workplace. Many have gone on to land jobs in the community. "They look forward to this every day," he said. "They learn to socialize, how to work, earn a paycheck and budget their money. It helps them grow." As the clients' work has slumped, so have Opportunity Village's donations, according to its chief development officer Linda Smith. As the organization looks to its big fundraising season over the next couple of months for help, Smith is hopeful donations will return. Opportunity Village's Magical Forest is Nov. 22 through Dec. 30, and the Santa Run is Dec. 6. "We went to Shell Oil and Green Valley Grocery and asked them to donate gas coupons to give away at Magical Forest," she said. "We're just trying to be very creative to think of ways to engage people who we know care." Opportunity Village was started in 1959 by a group of families who were searching for jobs for their mentally disabled children. The organization holds a waiting list of more than 200 adults in search of work. The organization has a Henderson campus, and it will open a third campus at the corner of South Decatur Boulevard and West Patrick Lane next month to move more men and women from the waiting list into jobs. 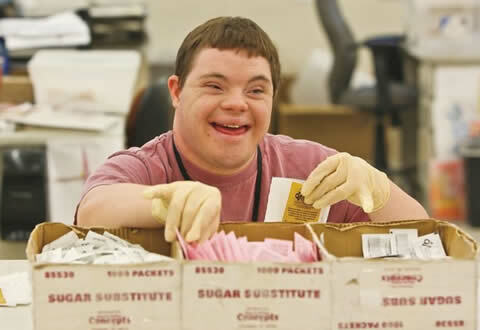 Kevin Schmidt, 22, prepares beverage condiment packages for Harrah’s Corporation on the main floor of the Employment Training Center at Opportunity Village. Charles Bender III works through a pile of metal and rubber pieces, constructing soundisolation inserts for a large-quantity fulfillment contract for Pack International at Opportunity Village. The valley's economic woes have put a pinch on the donations that fund charitable organizations, but at Opportunity Villages' Walters Family Campus in Henderson, people aren't looking for a handout — they're looking for work. The slowdown has dramatically reduced the amount of contract work that Opportunity Village has for its two employment training centers  one at the Henderson site and the other at the main office on 6300 W. Oakey Blvd. in Las Vegas. That threatens the income of the more than 350 intellectually disabled adults who work at them, officials said. A number of companies have pulled major contracts from the centers to keep the work in-house and reduce costs, said Opportunity Village sales coordinator Rachel Allen, who is trying to find work for the agency's clients. However, Allen said, they have it backward. Manning the conveyer belt, production associate Kelly Cooksey seals one of 200,000 condiment packs prepared monthly for Harrah's Corporation in the Employment Training Center at Opportunity Village. "(The companies) think they're saving themselves money to do it that way, but they're really not," she said. "What they were paying us pennies to do, they're now paying an hourly employee to do, and they don't do it nearly as fast as we do." Clients have been reassigned to the center's few remaining contracts, but there is not enough work to go around, she said. On one contract, assembling condiment packages for Harrah's, workers are months ahead of schedule because there is simply nothing else for them to do. With less money coming in, it's being spread thin between the workers, Keith Copeland, a manager at the Henderson employment training center, said. "A lot of these guys can't communicate like you or I can, but they've learned how to let me know when they're not happy with their paycheck," Copeland said. "And believe me, I'm hearing it." In Henderson, about 150 Opportunity Village clients work each day in the facility's assembly, doing packaging and document destruction. In recent months, the amount of contract work has dropped 60 percent in packaging and 70 percent in assembly, while an entire shift has been eliminated from document destruction — the most lucrative and highly sought job. Henry Coffman has been working on a project for Wynn Las Vegas, putting promotional tags on water bottles and shrinkwrapping them in bundles, for about six weeks. He said he loves his job, but that his paycheck lately has only been "OK."
"The work comes and goes," he said. To make matters worse, Opportunity Village plans to open a third work center in the southwest part of the valley in November  and while the facility will clear everyone off of the agency's waiting list, it has no work lined up for those who have been waiting. "We don't have contracts to house them," Allen said. "When the new facility opens, it's going to be difficult." Beyond employment, the profits that the employment centers generate are used to fund other programs at Opportunity Village, such as Pride, a free day-care service for individuals with extreme disabilities. The agency also sponsors dances and other social activities for its clients. Allen and Copeland are appealing to local businesses to evaluate their operations and see if there isn't some work they can outsource to Opportunity Village. "Any production or assembly contracts, we love," Allen said. "Any mailing contracts, we love. Basically, anything that (workers) can physically do, we'll take it." Jeremy Twitchell can be reached at 990-8928 or jeremy.twitchell@hbcpub.com. Cara McCririck assembles sound isolation clips at Opportunity Village in Las Vegas. It wasn't all that long ago that people with intellectual disabilities were institutionalized isolated from their families and communities. Education, vocational training, employment and integration into society simply weren't done. These days, thankfully, attitudes are much different. A number of organizations are providing win-win situations: enabling people with intellectual disabilities to obtain training and fulfilling employment, while helping manufacturers assemble their products for pennies on the dollar. One such organization is Opportunity Village (Las Vegas), a nonprofit employing people who have intellectual disabilities, enhancing their lives and the lives of their family. A facility of the Association for Retarded Citizens, Opportunity Village was founded in 1954 by a small group of local families seeking to improve the lives of their children with intellectual disabilities. Since then, Opportunity Village has grown to become Nevada's largest private, nonprofit community rehabilitation program, serving more than 350 people annually through vocational training, community job placement, advocacy, and social recreation programs. Employees of Opportunity Village help businesses from coast-to-coast assemble their products, saving them money and freeing up valuable time. For example, PAC International Inc. (Las Vegas) makes sound isolation clips for building construction. The clips are placed between drywall and studs or joists to prevent noise-producing vibrations from traveling room to room. Each device consists of a clip, a fastener, a washer and rubber vibration-dampening component. Originally, the company assembled the clips out of the country—until they found Opportunity Village. "Opportunity Village has delivered consistent production results, allowing us to focus on the most important part of our business—our customers," says Elzo Gernhart, vice president of PAC International. "Opportunity Village is reliable and cost-effective." Viracon Inc. (Owatonna, MN), a window and glass manufacturer, was assembling its product at a plant in the Midwest even though its distribution was headquartered in Utah. According to Viracon's senior buyer Rabecca Shamblen, having Opportunity Village complete the work was a logical choice because the freight charge was cheaper. "Not many people know we can offer valuable services to businesses nationwide," says Laura D'Amore, sales and marketing manager for Opportunity Village. "We can handle most assembly and packaging jobs; people just need to give us a chance." Although it's a nonprofit, Opportunity Village operates like a for-profit business. It has a large warehouse and loading area where contracts come in, are inventoried, assembled, packaged and then distributed. A threestep quality assurance process ensures customers' products are being checked at the assembly tables, on the pallet, and lastly, in the warehouse prior to shipment. According to D'Amore, quality is a crucial step to providing assembly services. "Why pay a $10- to $15-per-hour employee to assemble your product when we can provide the same quality for a fraction of the price?" asks D'Amore. "We are competent, able and willing to do what is needed to get more contracts in our Work Center. We have many of the same services for-profit manufacturing plants have; we just have the added benefit of helping people in the community." Opportunity Village also builds adaptive devices to help employees complete contracts accurately and quickly. For example, project supervisors constructed a jig for the Sound Isolation Clip. The jig helped workersassembled the clip correctly, allowed them to quickly count the units, and expedited processing time. 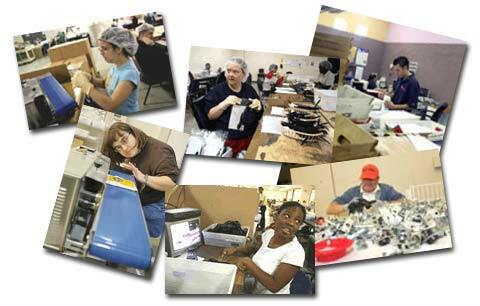 Opportunity Village handles a wide array of contracts, from stuffing small bags to assembling large components and kits. Satisfied Opportunity Village customers include Cox Communications, the Las Vegas Convention and Visitors Authority, Harrah's Entertainment, MGM/Mirage, Nevada Power, Southwest Gas, and the Las Vegas Valley Water District. For more information on Opportunity Village's business-to-business services, call 702-880-4022, send an email to damorel@opportunityvillage.org. Shortly after relocating to Nevada, PAC International began utilizing the services of Opportunity Village, a non-profit community rehabilitation organization, to assemble Resilient Sound Isolation Clips (RSIC). The move to Nevada allowed PAC to grow rapidly and better serve the demand for quieter and more fire safe buildings. "As PAC International grew, we wanted to find ways to give back to the community," says Elzo Gernhart, Vice President of Sales. "The search for ways to be more socially responsible lead us to Opportunity Village, an organization dedicated to helping adults with intellectual disabilities who are capable of assembling products. This relationship is a win-win business solution for assembling our RSIC clips and meeting weekly production goals." Components for RSIC clips are manufactured in America and shipped to Nevada. Opportunity Village individuals assemble millions of RSIC clips. "PAC International is the largest ongoing contract for Opportunity Village, utilizing a substantial percentage of our available workforce each week," according to Laura D'Amore, Opportunity Village's Sales and Marketing Manager. "PAC is a shining example of a socially responsible company and we would love to have more customers just like them." PAC has evaluated automated assembly of RSIC clips numerous times and has chosen the socially responsive route - supporting our country by manufacturing in the United States and supporting our local community by utilizing the services and individuals of Opportunity Village. "Opportunity Village has the capacity to assemble more than 100,000 clips a week with current staffing levels, and there is more capacity that can be utilized to meet future PAC International growth and customer demands for RSIC products," says Laura D'Amore. PAC enjoys the relationship that has evolved with Opportunity Village and encourages other businesses to join them in being both socially responsible within the U.S. and within their local communities.